I ORDERED FOOD FOR WORK AT 11:00 RIGHT WHEN THEY OPENED AND I DIDNT RECEIVE MY ORDER UNTIL 1:00. THEY DIDNT OFFER ANY APOLOGIZES OR ANYTHING FOR THE 2 HOUR WAIT THEY HAD ONLY EXCUSES. I LOVE TSING TAO BUT THIS WAS JUST OUTRAGEOUS!!!!!!!!!! They charge and forget the red sauce to the sweet and sour chicken and also the crab Rangoon. Then when you call them they won’t correct the situation and will blame the costumer. Desiree was no help at all and just made matters worse. Have eaten there several times and each time it has gotten worse. Will not be going back. We love this place and order delivery often, only problem is when we try to order online via their website it says we are out of their delivery zone then we have to call (and its no problem). Would be nice if you can fix this issue, you should be aware (per my work experience) that people tend to order more online anyways so it would be in your benefit to fix this in the long run. Food is decent. Service isnt great. Prices are wrong from menu, somehow i always order $6-8 more than the price stated. Will be moving back to Lexington soon and I'm excited to have good chinese with excellent service again. Something that is seriously lacking in Richmond. The food was awful and cold, believe it or not there was a fly in my rice, and when bringing to the their concern they said there was no manager available and said I was making this all up. Horrible place NEVER GOING AGAIN!!!! The food is decent, but they frequently get your order wrong even after repeating it and if you’re lucky you will get the person on the phone who immediately accuses you of being wrong. I order delivery quite frequently, each order 23.12 or more because we usually get the same thing and maybe all but 1 time the order was actually correct. My last straw they got the order wrong when I ordered from work with coworkers and rather than trying to make up for it they were too busy trying to take back the order they they dropped that was wrong before they delivered the correct order. Makes me wonder if we are getting someone else’s food. I will never patronize them again. After calling and voicing that I will not the person on the phone did nothing to try to change my mind. I will go to King Buffet from now on. My favorite Chinese restaurant in Richmond. Their sesame chicken is my favorite! They deliver, so it's super convenient. It's a tradition for my friends and me to order in at least 2-3 times a month! Ordered hunan combo and sichuan chicken: both had identical sauce and veggies. The chicken was not real meat, but rather it was a processed meat, like the inside of a nugget. Service was poor and not friendly. The best chinese food I have ever had! Im basically a regular here. But the pictures are wrong. Tsing Tao is great! They have some great (Americanized Chinese) food and I've never had a problem with delivery or my order. I wish we had a local place who serves traditional Chinese food too. But, one negative thing is that their parking is horrible! :( I would rather call in an order and have it delivered than dine-in, and since they redecorated and expect people to eat there, they really need to do something about the parking. Great Chicken and Rice Noodles! The delivery guys are awesome too, very speedy. Great tasting Chinese food. 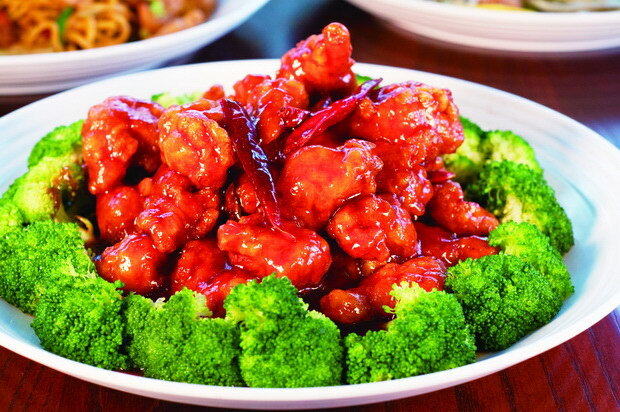 I highly recommend the General Tso's chicken - it's very delicious. I live out in Madison County, and they do deliver all the way out to my house. Delivery time from their location in Richmond to my house out ...? The food is generally good from here - typical Americanized Chinese fare. I'm partial to the General Tso's chicken (I recommend liberal use of soy sauce on it) and my wife likes the chicken and snow peas combo. They do deliver, but it ...? All Review Photos There are actually quite a few Chinese restaurants in the area. Tsing Tao is my favorite for a couple of reasons. For one, obviously, the food is really good. I mostly stick with the lemon chicken which is served with ...?